“. . . and though she be but little, she is fierce” is a quote from A Midsummer Night’s Dream to describe the lovely Hermia. Extremely diminutive, Hermia is the visage of delicate beauty. But, don’t be fooled, cries her rival Helena, because in spite of her small stature, Hermia is a force to be reckoned with. The same could be said about Chive. Chive is the smallest species of edible onion. It is a cool season, cold-tolerent perennial plant that flowers from April to May in the southern parts of its habitat zones and in June in the northern parts (hardiness zones 3-9). Chive is easy to grow for a novice gardener and adds nice texture to the landscape. Chive grows to be 12 to 24 inches tall and may spread a foot across. In the plant world, that’s pretty little. But, remember, like Hermia, even though Chive is small and dainty, it’s fierce. Chive is believed to repel a number of harmful insects including aphids, beetles, cabbage worms, Japanese beetles and slugs. Adding chive to your garden where you grow parsley, broccoli, cabbage, eggplant, kohlrabi, mustard, peppers, potatoes, rhubarb, roses, squash, strawberries or tomatoes will help those plants. Companion planting chives with carrots will improve both the growth and flavor of your carrots. Grapes benefit from Chive’s ability to repel aphids. Although Chive repels insects, the sulphur compounds in it attracts bees and other beneficial insects. Beets and carrots are also good companion plants for chives. 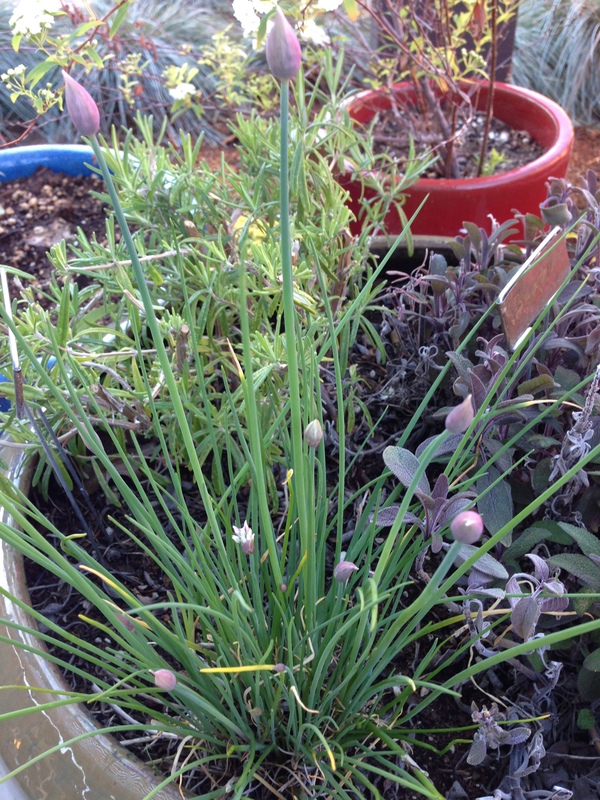 When chives are planted near carrots that have been allowed to bloom, it confuses both onion and carrot flies. No-no’s. Chive companion planting in a bed with asparagus, beans, peas and spinach isn’t recommended. Chive will help prevent both apple scab disease and black spot on your roses but the plant may need to be several years old before becoming effective. Chive also reduces the incidence of fungal diseases and mildew. Chive seeds are quite small. Plant seeds directly into the garden ¼ inch deep after soil has fully thawed and warmed. You can also find chive plant starts at your local nursery if you would rather pass on the seed propagation phase. Chive needs plenty of sunshine, but will grow well in partial shade. Plant in clumps of 4 or 5 in well drained soil, keeping clumps at least 8 inches apart. They should be separated at least every 3 years and divided to perform well. Plants are propagated by dividing the clumps in the spring or fall. The clumps will consist of a number of small bulbs – leave at least 6 bulbs in each division. For best results, don’t grow chives in the same place for more than 3 years. Cut chives near the base of the plant when harvesting, and they will regenerate quickly. Chives can be snipped after they establish and at least 6 inches tall. Don’t cut them all back because they need a few leaves to keep growing. I came across your site dirtywordsgarden.com from Google search, and found your site is not rank on Google page #1 for some of important “buying-intent” keywords. Do you want to have your site dirtywordsgarden.com get found on Google #1 page for some profitable keywords? I have written and prepared the SEO step by step report specifically for your site dirtywordsgarden.com for you, and you can get it for 100 free of charge now. It’s super easy to follow. You don’t need to have any knowledge in SEO to rank your own site now.